Since I never dveloped much AWS expertise (never needed to since it just worked) I was afraid to do anything. That’s sort of why I had kept it running for three and a half years – the last time I had to stop it didn’t work out so well. It helps to review the terms. image – that’s like the OS. It has a unique identifier. Mine is ami-03559b6a. instance – that’s a particular image running on a particular virtual server, identified by unique number. Mine is i-1737a673. I didn’t! Before the retirement deadline I stopped my instance. That is a painful process because it takes hours in my case. The server becomes unavailable quickly enough, but the status is stuck in state shutting down for at least a couple hours. But, eventually, it does shut down. Then, I start it again. That’s it! When it starts, AWS puts it on different hardware, etc, so I guess literally it is a different instance now, running the same image. I re-associate my elastic IP, and all is good. So when the “retirement” date came along, there was no outage of my instance as I had already stopped/started it and that was all that was needed. In case I couldn’t restart my image I had taken snapshots of my EBS volumes, and prepared to run Amazon Linux, which looks pretty similar to CentOS which is what I run. But, boy, learning about VPC and routing was a pain. I had to set all that up and gain at least a rudimentary understanding of all that. None of that existed six years ago when I started out! It was much simpler back then. 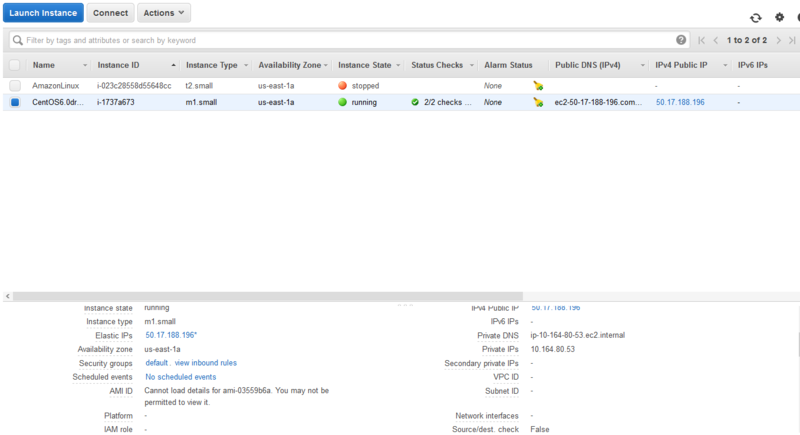 To make things concrete, here is my view on the AWS admin portal of my instances. 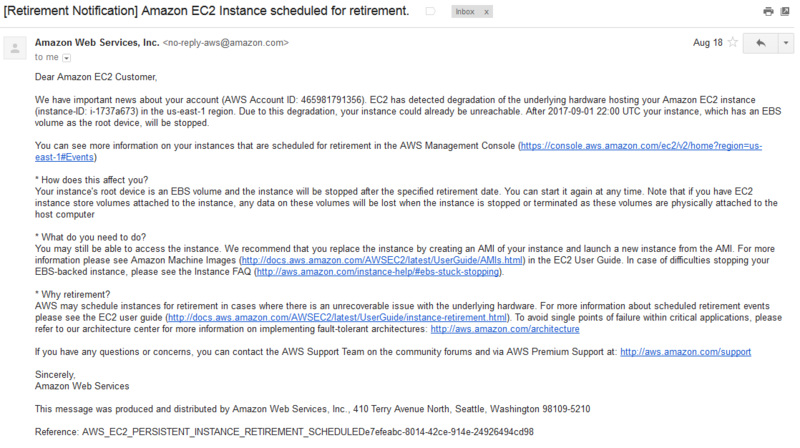 Having your Amazon AWS instance retired is not as scary as it initially sounds. Basically, just stop and start it yourself and you’ll be fine. This entry was posted in CentOS, Hosting Service and tagged Amazon AWS. Bookmark the permalink. Hello, I’m with the same problem, when did it take time to stop the server? I have 2 hours and I still can not stop the instance. Probably it will be stopped by the time you wake up.